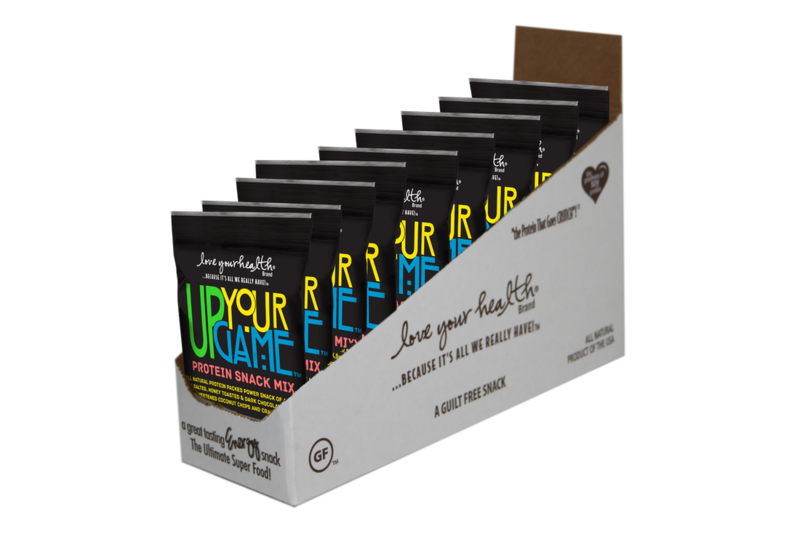 UP YOUR GAME™ All Natural Protein Snack Mix is here!A unique mix of wholesome Almonds and a power house of Sea Salted, Honey Toasted and Dark Chocolate covered Dry Roasted SoyNuts, blended with Toasted Coconut Chips and Juicy Cranberries. With 10g of balanced Protein, the adventurously Nutritious and Delicious Protein Packed Power Snack will elevate your strength, ignite your fuel, and UP YOUR GAME™ on and off the courts of life.Make UP YOUR GAME™ Protein Snack Mix a part of your healthy lifestyle and challenge your competition. For international distribution opportunities in your country or to receive a PowerPoint presentation, information on best-selling items, or pricing, please contact your Groceries USA sales team.Happy Crunching! Love Your Health offers a shelf life of 12 months from the date of production.